Can OWL and Logic Programming Live Together Happily Ever After? Logic programming (LP) is often seen as a way to overcome several shortcomings of the Web Ontology Language (OWL), such as the inability to model integrity constraints or perform closed-world querying. However, the open-world semantics of OWL seems to be fundamentally incompatible with the closed-world semantics of LP. This has sparked a heated debate in the Semantic Web community, resulting in proposals for alternative ontology languages based entirely on logic programming. To help resolving this debate, we investigate the practical use cases which seem to be addressed by logic programming. In fact, many of these requirements have already been addressed outside the Semantic Web. By drawing inspiration from these existing formalisms, we present a novel logic of hybrid MKNF knowledge bases, which seamlessly integrates OWL with LP. 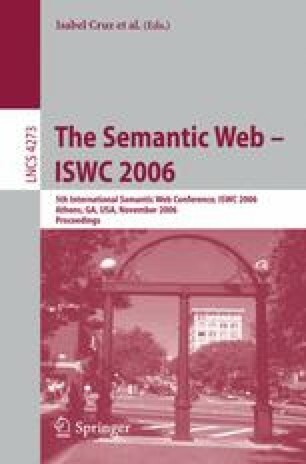 We are thus capable of addressing the identified use cases without a radical change in the architecture of the Semantic Web.